Thank you, voters! 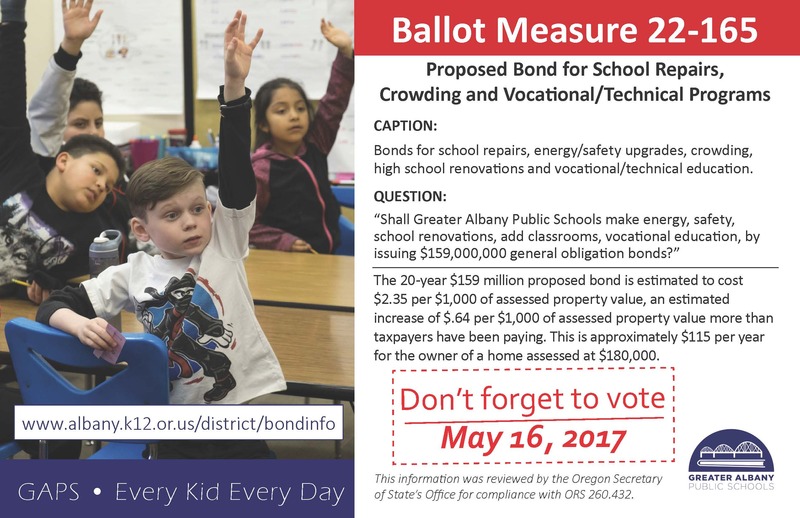 Our community passed Ballot Measure 22-165 in the May 16, 2017 election. These projects will improve schools and impact Greater Albany students for generations. The proposal includes projects at every school in the district. It also includes plans to construct a new elementary school near Timber Ridge, a reconstruction of Oak Grove Elementary School, phase I of the reconstruction of West Albany High School and a new gym/CTE space at South Albany High School. Information about enrollment projections, critical facility improvement needs, program deficiencies and building ages. Community survey results, District Facility Advisory Committee reports and community forum information.